What can happen if a student turns in purchased assignments or papers? When you pay someone or a company to complete an assignment or write a paper for you. You then submit this work as your own. If my assignment or paper is 100% original, how could I get caught? Many companies and individuals who advertise these services guarantee originality. Even if they come through on that guarantee, the work is still not in your voice or style. What do I mean? Everyone has a unique writing style or voice. If you produced work previously in a class, then buy a paper and turn that in, the style or voice will not match. Yes, Turnitin may not recognize a match, but good professors will notice that something is not quite right. 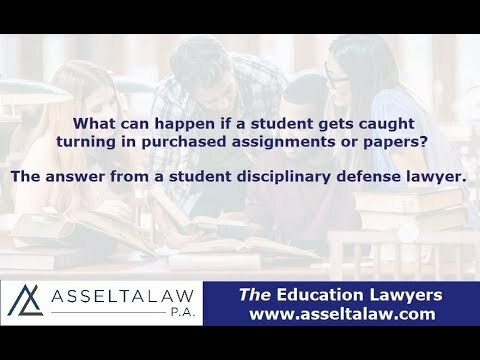 What should a student do if they are suspected of turning in a purchased assignment or paper? Contract cheating can lead to not one, but several academic integrity violations. Depending on the situation and facts, the student may be facing suspension or expulsion from school. I work with students all over the country facing disciplinary sanctions in college. Richard Asselta is a disciplinary defense lawyer who represents students nationwide. If you find yourself accused of an academic integrity violation, call Asselta Law today. Free consultation. Click here to read what clients are saying on Avvo, a lawyer review website.